Having heard great things about Antonio Park’s westmount restaurant Park – Our expectations were set high going into the the experience. The first surprising thing is that it’s in westmount at all – this is not fertile culinary ground – NDG yes, westmount No. Park is situated on Victoria street (close to sherbrooke) below Victoria Park Spa where the now defunct Vic Park Market once was. The first thing we noticed when walking in was the ambiance – it didn’t feel like we’d just walked into a restaurant. We arrived around 9 oclock and place was still lit very bright and had a casual atmosphere. We started with the drink menu and ordered a pint of Sapporo and a Yuzu tonic. And herein lies the main issue with this restaurant. What do I mean by this? My Pint of Sapporo was $12. Now I have drank pints of Sapporo in more restaurants than I can remember in Canada, major american cities, europe, asia – you name it. $12 for a pint of Sapporo is not an exaggeration, it’s profane. The Yuzu tonic was also $12. Now I don’t mind spending $12 on a cocktail when the the quality is there to back it up. I’ll happily sip $14 cocktail at the Black Hoof for as long as my credit card will allow. But make no mistake about it – this yuzu tonic was good, but not a $12 cocktail. In fact anyone with a cursory understanding of what a bar should and shouldn’t be would be able to notice that Park’s “bar” is not really a bar. It’s certainly not fully stocked. I won’t harp on the prices for too long but the westmount tax applied to all the mains as well – a single maki roll was being sold for $19. The most obvious reason for this is simply that the restaurant is located in Westmount and it’s clientele simply doesn’t pay any attention to prices when they go out to eat. On to the positives. The menu is very thoughtfully conceived and the food is well executed. 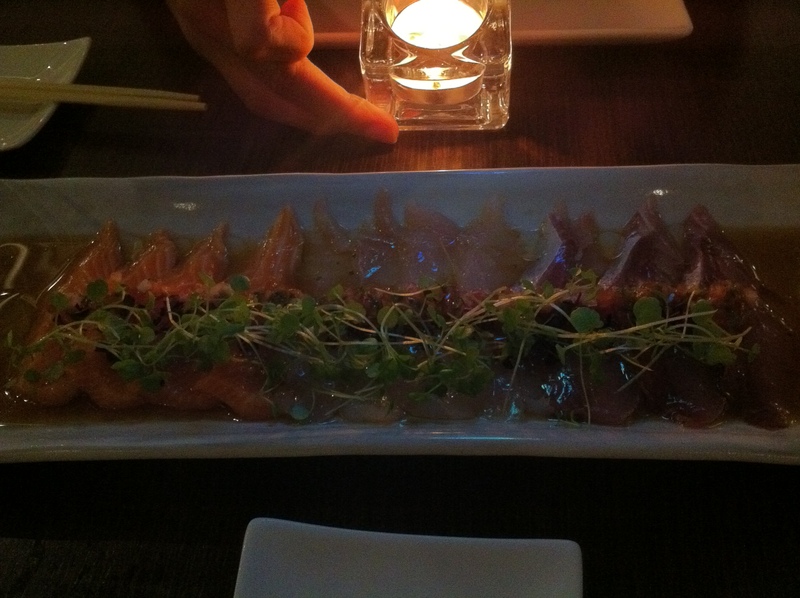 We started off sharing the 9 piece Park sashimi which included Tuna, Flounder and Salmon. The Sashimi was topped with a delicious chimichurri sauce and each piece was fresh and tasty. We followed up by ordering the Jap Chae with Chicken and Park Bowl with Salmon. The Jap Chae was the only dish we felt left something to be desired and came off as austere and missing some depth. The Park bowl was very delicious and felt extremely healthy. There were a great deal of vegetables, hot multi-grain rice, egg and even some spicy gochujang sauce. We also ordered a dessert which was a Yuzu ice cream with Yuzu cracker and two kinds of melon gelee. The dessert was excellent – very light and full of great flavors and Asian textures. The food at Park is definitely great – if price is of no concern to you, this restaurant has little to no downside. For everyone else – the prices are excessively high – even considering the quality of the food you get. Tags: Asian, Beer, Cocktails, Japanese, Montreal, Noodles, Park, Sashimi.